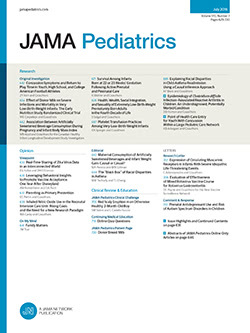 To the Editor As the professional association representing the national standard in lactation care, the United States Lactation Consultant Association was quite dismayed after reading the Viewpoint in JAMA Pediatrics, “Unintended Consequences of Current Breastfeeding Initiatives.”1 The unsubstantiated assertions regarding the risky nature of steps 4 (skin-to-skin care), 6 (breastfeeding exclusivity), 7 (24-hour rooming in), and 9 (elimination of pacifier use) of the Baby-Friendly Hospital Initiative are disappointing. Infant falls from hospital beds and sudden unexpected postnatal collapse, while tragic, have also occurred well before the Baby-Friendly Hospital Initiative was implemented in hospitals. Formula supplementation of breastfed infants in the hospital poses risks of its own when not engaged in for medical reasons and is strongly associated with shortened duration of breastfeeding. Banked donor human milk is a much safer choice for supplementation, reducing the potential for dysbiosis in the newborn gut’s microbiome that infant formula can provoke. There is no evidence to suggest that pacifier use during the first 3 days post partum has any effect on sudden unexpected postnatal collapse, which is not synonymous with sudden infant death syndrome, as the article somewhat curiously implies. The American Academy of Pediatrics recommends delaying pacifier use until breastfeeding is well established because early use may decrease the frequent feedings needed to build maternal milk supply. Sudden infant death syndrome before 1 month of age is exceedingly rare. Safe sleep and skin-to-skin care in the hospital have been addressed by the American Academy of Pediatrics with guidelines for the safe practice of both. Following such guidelines would go far in reducing the rare occurrence of infant falls and sudden unexpected postnatal collapse. Instead of abandoning the Baby-Friendly Hospital Initiative, provision of staff education and adequate staffing to allow for the application of the necessary vigilance and monitoring would go far in ensuring the safe coexistence of optimal, evidence-based maternity care practices that are implemented in a safe manner. Personal opinion should not be allowed to overshadow the known benefits of breastfeeding and the Baby-Friendly Hospital Initiative.